High Prairie Outfitters offers fully guided waterfowl hunts in Saskatchewan, Canada. 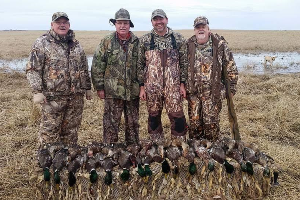 Expert waterfowl hunting and fully licensed Saskatchewan outfitter Kyle Hauck can give even the most experienced waterfowl hunter a trip to remember. With opportunity to see large flocks of Canada geese, snow geese and speckle belly geese working Kyles decoy spread, you can be assured of a World Class Waterfowl Hunt. All meals and lodging are included and be sure to ask about a custom waterfowl / upland hunting combo hunt. High Prairie Outfitters offers World Class Saskatchewan Upland Bird Hunting. In our region, you can expect to harvest Hungarian partridge and Sharptail grouse. The limits are 4 partridge and 2 sharptail grouse per day. One of the main benefits with booking a Saskatchewan upland hunt with us, is the extensive amount of private habitat that we have available to us in our region. 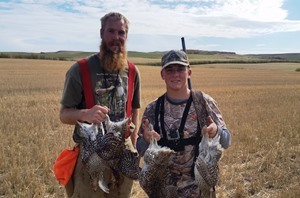 We conduct ample pre-season scouting each fall to ensure that our hunters encounter numerous coveys of upland birds during their Saskatchewan upland bird hunt. We also have the luxury of making sure that none of our hunters have to hunt the same ground twice during the same season! 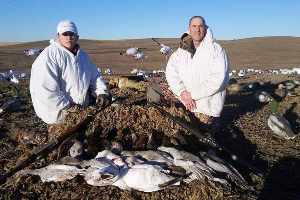 At High Prairie Outfitters we offer World Class snow goose hunting, Canada goose hunting and duck hunting for the waterfowl hunting side of the hunt. Then we offer World Class Hungarian partridge hunting and sharptail grouse hunting for the upland end of the hunt. We can ix and match a half day of each or spend a day or two after one or the other and switch up our game plan for the second half of your Saskatchewan bird hunting trip. We can meet any length of stay or group size. THIS IS YOUR HUNT!